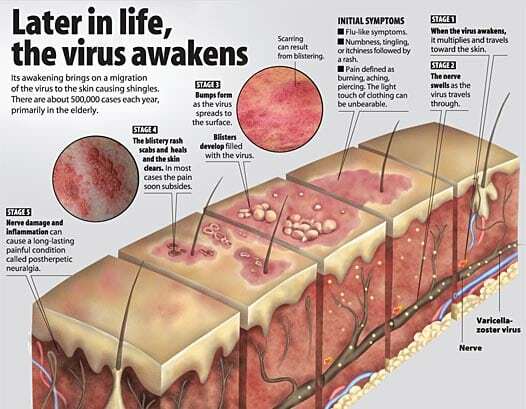 In this article, we continue talking about the Human Herpes (HHV-3) in its reactive form which is called Shingles (Herpes Zoster). Malignancy (Lymphoma, leukemia or tumor in the dorsal root ganglion). Reactivation of the latent virus (which was primary chicken pox) results in infection of the posterior root ganglion of spinal cord or extra‐medullary ganglion of the cranial nerve then spreads down the nerve fibers of the skin of the dermatomeleading to vesicular eruption, unilateral, segmental, along the Cutaneous distribution of the nerves. Age: adults and old age. Rare in children except Child had chicken pox in the first few months of life. Very Rare Congenital: Mother had chicken pox during early pregnancy infant will suffer from Congenital Varicella Syndrome (Limb deformity, ocular lesion, Extensive scarring, Muscular atrophy, cerebral and psychomotor retardation). Fever, malaise, tenderness in the involved nerve. Unilateral itching and neuralgic pain (burning or stabbing/ Constant, intermittent or radiating). Unilateral and liner papules or vesicles along the dermatomic distribution (skin and mucosa membrane) supplied by the affected nerve. The papules or vesicles are surrounded by erythema. After a few days, the clear fluid becomes purulent. One week later the vesicles rupture forming a crust. 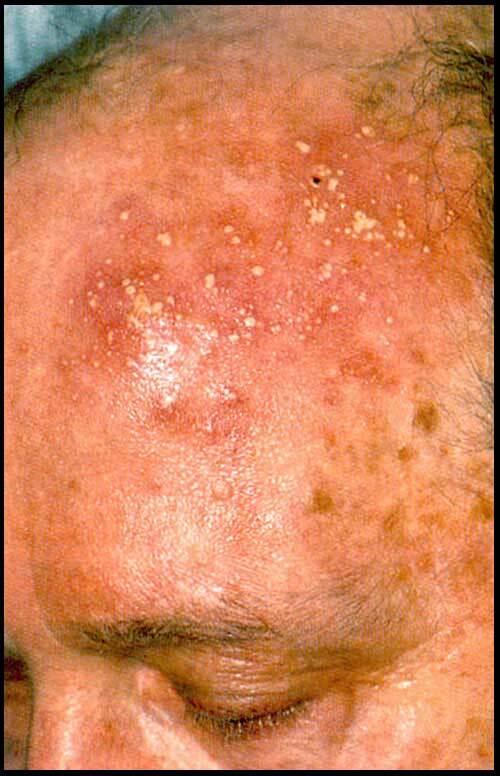 The Skin lesions are mixed (similar to chicken pox) papules, vesicles, pustules, and crust are present together, why? because it occurs in successive waves. Scar formation, why? Due to 2nd infection. Scars are painless and sometimes very painful to touch (Hyperalgesia). Scars are diagnostic for postherpetic neuralgia. May involve one or more branches of trigeminal nerve. Vesiclesulcersscarring (Painful and surrounded by erythema). May be bilateral lesions in Viremia. Confluent and necrotic oral lesions in immune‐suppressed patients. Involving cheek, tongue, the vestibule of the lower jaw and Cutaneous lesions extending from the chin to the vertex. Involving hard palate, soft palate, the vestibule of the upper jaw, skin of cheek and sides of the nose. Involvement of Ophthalmic division (most common). Most common (15 – 20 times more than the mandibular division). Identical to herpes simplex viral infection. Clinical examination (vesicles and ulcers = Unilateral, along with nerve course, painful). Avoid 2nd infection by proper hygiene (0.2% chlorhexidine mouthwash or Rifampicin elixir mouth bath) 4 times daily. 5% Acyclovir ointment for skin and eye lesions. Topical capsaicin (hot peppers), why?Topical anaesthesia aren’t effective since pain arises from the sensory nerve.